Thank you to my cousin Bea for taking my photos under the scorching sun! I haven't been feeling all that well lately. I'm going through one of my health issues again (and I feel sad that I have to say the word "again" because I make it sound like it's normal for me now when it's not). But anyway, I'm just glad I have a couple of drafted posts. If ever I may need to take a quick break, I can just schedule them. For now, here's what I wore last Saturday when I went out with my best friend-slash-cousin, Bea. It has been kind of hard trying to dress weather-appropriate since it's always sunny during daytime and then it starts to pour come night time. I guess the sun is just squeezing its remaining rays for Manila before leaving the sky all to the dark clouds. And here I am, just trying to play around with colors and prints once again. I don't go so much for lighter colors because of my skin tone. It's hard to find colors that compliment me. I look so tired. I am. I hope I feel better soon :( I will need to schedule a visit to the doctor though. Self-medication just won't do. I had my nails done earlier that day at Nail It Salon, and I really loved the effort of my nail technician to manually paint design my nails into the aztec design they had on display! The fun part was customizing the colors! 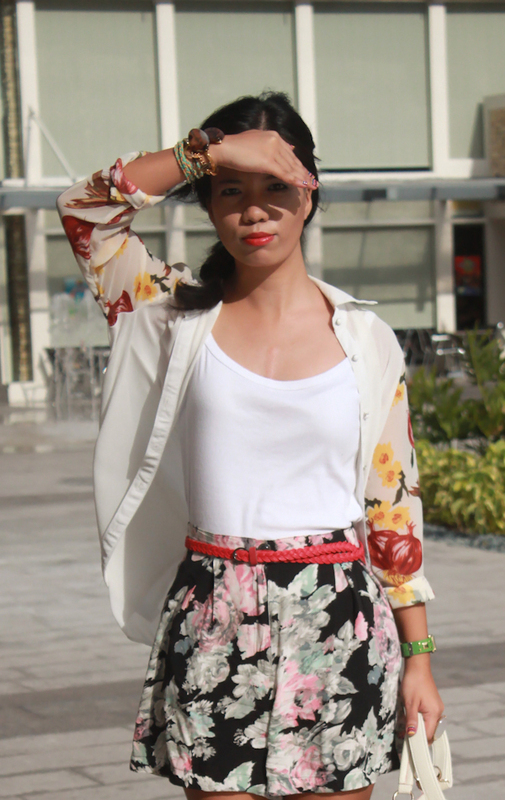 I guess you can say I still have a hangover from Zalora Fashionalismo - Independence Day Party with the colors I used! What do you think? cool outfit, i so love that floral cardigan! I love your bag and that skirt is super cute!